Making your own potholder is a fun and easy project, whether you're an advanced seamstress or are just learning to use your sewing machine. These cute striped potholders will protect your hands and brighten your kitchen, and they make great hostess or housewarming gifts as well. You can use this free pattern to make adorable rainbow striped potholders. The finished potholder is 6.5 inches square and has a handy loop for hanging. This simple project will take you about an hour. 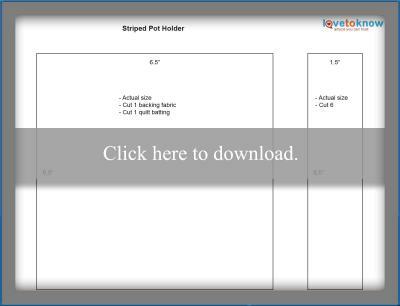 Start by printing the free pattern for the potholders. Simply click on the image to download the PDF file, and then print the image. Cut out the pieces as directed. For the rainbow potholder, you'll need strips in all six rainbow colors and a backing square in white quilting cotton. Click to print the free pattern. Using the photo of the finished potholder as an example, take the red strip and the orange strip and place their right sides together. Sew a seam 1/4 inch from the edge up one of the long sides. Then add a yellow strip to the other side of the orange strip in the same manner. Continue adding strips until you have used them all. Press the seams open. Place the white square on your work surface. Stack the quilt batting on top, lining up the edges. Then add the rainbow striped piece. Use safety pins to hold all the layers together in a "quilt sandwich." Adjust your sewing machine's stitch length to 3.5, and sew along the seams joining the stripes together. This quilts the potholder and makes it more durable. Trim all your thread ends when you're done. If you're making your own binding, cut it out and press it. If you're using packaged binding, use your iron to remove any creases from the packaging. Place the binding on top of the rainbow side of the potholder, lining up the raw edges with the raw edges of the quilt sandwich. Use pins to secure one side. Starting 1/4 inch from the end of the binding, begin sewing it to the potholder using a 1/4 inch seam allowance. Continue until you get near a corner. When you are 1/4 inch from the corner, stop sewing and lower your needle. Raise your sewing machine foot and pivot the potholder 90 degrees. Pull the binding down to line up the raw edges with this side. Adjust it so that you have a square corner and the excess binding is behind your sewing machine needle. Lower your presser foot and continue sewing. Repeat this process at each corner. At the final corner, sew all the way to the end of the potholder, rather than stopping 1/4 inch from the edge. Create a loop with the binding and then continue sewing until you reach the spot you started. Fold over the raw edge of the binding and slip it over the other raw end from where you started. Sew to secure. Use straight pins to fold all of the bound edges over to the other side of the potholder. For the hanging loop, finger press the raw edges into the binding. Use a slip stitch to hand sew the binding down to the white backing fabric and to sew the raw edges of the loop in on themselves. You're done! Craftsy has a great quilted potholder tutorial. You can choose from a 16-patch or 20-patch design and rounded or square corners. This is a good choice for beginners. AllFreeSewing offers a free pattern for an adorable heart-shaped potholder. This project is easy, although it's best if you have a bit of previous experience. Pretty Prudent has a fun tutorial for making a quilted potholder with a pocket design. This is a simple project and makes a good introduction to quilting. A Spoonful of Sugar has a cute round potholder design with pockets. This is a bit more complex, but the finished product is beautiful. Sewing a potholder is a great way to try your hand at simple machine quilting. Don't feel that you're limited to the rainbow color scheme. You can make this design in any color to match your kitchen decor. Have fun trying lots of different fabric and color combinations.